A Megadeth fan has spent $11,300 in an eBay auction for an ultra-rare prototype Jackson Y2KV (J6443) guitar that was specifically created for the band's Dave Mustaine. This natural unfinished Jackson Prototype was designed by Mustaine and presented to him on 12/23/1998, and was featured on several magazine covers including Guitar Magazine in 1999. This was the first guitar with the final 3+3 Y2KV head, but with dot inlays, rosewood fingerboard, alternate knobs and a blade switch. The body shape was not quite finalized either, but this was the 1st approved prototype, used by Dave Mustaine as reference for the final prototype. 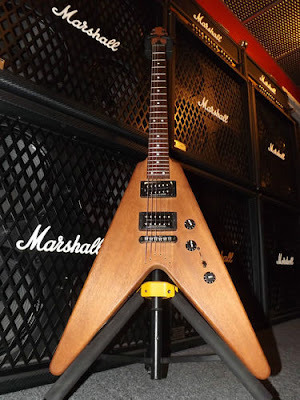 Jackson Y2KV was a guitar designed by Mustaine, in an effort to create a less aggressive and retro-looking flying V guitar, to contrast for his usual King V. It was mainly used for touring of Risk and The World Needs a Hero as Mustaine's own model, with less than a dozen produced, including some prototypes like this guitar up for auction. Eventually, the Y2KV went in mass production and introduced in the Jackson Guitars year 2000 catalog. View the Mustaine eBay auction details here. Megadeth are currently in the studio working on a new album.